Marilyn Henderson, D.P.M., recalls being asked why she wanted to be a podiatrist when interviewing for her entry into podiatry school, and her answer was because she wanted to help people, something she has definitely accomplished. Henderson is originally from Wilkes-Barre but moved to Lancaster when she decided to attend Franklin & Marshall College. In 1983, she graduated from the Pennsylvania College of Podiatric Medicine in Philadelphia (now known as the Temple School of Podiatric Medicine). Four children and 34 years later, she still calls Lancaster her home. “+” marks the spot with the Multiwave Locked System (MLS), the most advanced laser therapy system available. Although she had no family members in healthcare in whose footsteps she was following, the field of medicine appealed to her, so Henderson enrolled as pre-med at F&M. “I always knew that I wanted a family, so traditional medicine with ‘on-call’ duty was unappealing,” she recalled. Because the field of podiatry allowed for a schedule that would give her the chance to practice medicine and still raise a family, she decided to pursue it. 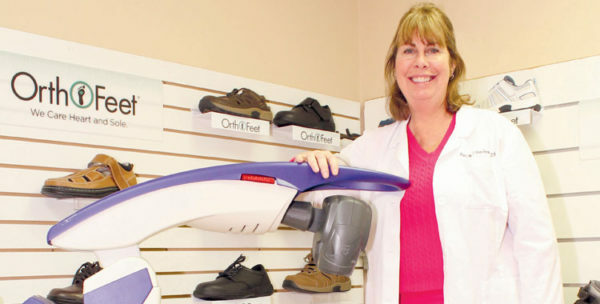 She began her career as an associate for an established podiatrist, but her husband, the one with the entrepreneurial spirit, encouraged her to open her own practice in Millersville. For Henderson and her enthusiastic staff, a good day at the office means that every patient shows up for scheduled appointments. She admits there are times when she and her staff struggle with “no shows,” but that doesn’t put a damper on their enthusiasm for the work that they do. “I have a great staff of two younger associates and seven ancillary staff who come up with great ideas at our 7:45 a.m. morning huddles,” she said. As a woman in the field of podiatry, Henderson said she and her female associates have never felt that gender has affected their work negatively, and, in fact, she feels it has helped. “Who wouldn’t want to schedule an appointment for foot pain with three lovely women who provide the best gentle foot care in Lancaster County?” she said. One of the newest services available at Henderson Podiatry is the MLS laser, something Henderson discovered at a conference she attended. “Podiatrists were getting fantastic results using the laser to treat a number of conditions that cause foot and ankle pain,” she said. 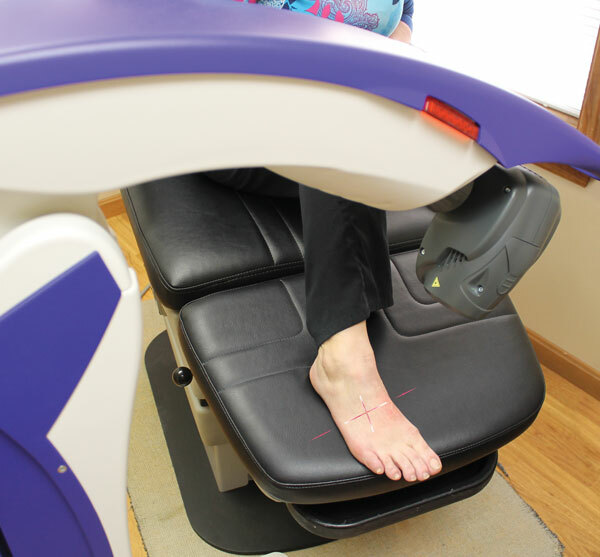 One group of patients who are benefitting greatly from the use of the laser are those suffering with neuropathy. Henderson Podiatry specializes in treating diabetics, as they are at risk of complications in the feet. The practice participates in the therapeutic shoe program, which provides one pair of shoes to a diabetic-practice patient each year for those who qualify. Because giving back is important to Henderson and her staff, when shoe styles are discontinued, the shoes are donated to the local VA hospital. And if Mom or Dad is at risk for falls, Henderson recently added a fall-assessment protocol, allowing her to diagnose and treat geriatric patients who are in jeopardy. 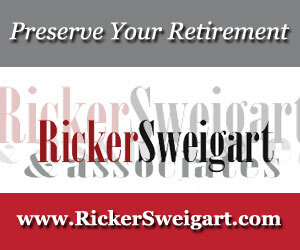 Giving herself an email address that includes the humorous self-descriptive term “piggyfxr” is just one indication of the kind of treatment that Henderson and her staff strive to provide for their patients — one that is effective but also keeps things light and positive.